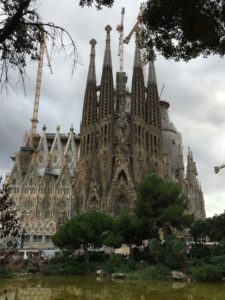 Lessons from Spain | Welcome to Prints on Purpose! I’ve been away for a while. We took a 15-day trip to Spain and Boston from mid-to late October, and the combination of preparing for the trip, taking the trip, and recuperating from the trip, not to mention the turmoil of the presidential election and its aftermath here at home, has meant living in a prolonged state of temporary chaos. I’m finally settling down a bit (albeit in fits and starts), and taking time to think about these past few weeks. The trip was quite an adventure, and as with most adventures, I learned a few things along the way. The first lesson involved packing for this expedition. Usually, when I take a long trip, especially to a foreign country, I pack a huge suitcase and check it in at the airport. This time, realizing that we’d be doing a lot of plane hopping along the way, and we’d be hard to catch, I worried about losing my luggage. So instead of a virtual steamer trunk, holding more than I could possibly use in two weeks, I traveled with a single carryon suitcase and a tote bag. The experience made me think about my internal and external baggage. In truth, it’s the internal baggage that seems to result in the external. The fear of not having or being enough. Fear of boredom, of hurting someone’s feelings, of holding on to extraneous stuff ‘just in case.’ And carrying all of this internal baggage has consequences in the external world— bearing the physical and emotional weight of too much stuff. We recently completed eight weeks of handling some of that baggage in our Creative Clutter Clearing mastermind. That experience was as liberating as traveling lightly, trusting that we have, that we are, enough. How about you? What kind of baggage are you carrying? What is it doing for you, and what is it doing to you? This entry was posted in Navigating Change and tagged Creativity, Discernment, Exploration, Initiating Change, Journey, release, Transitions on December 7, 2016 by Donna Mills.